Compact and versatile semi-modular analog synth. 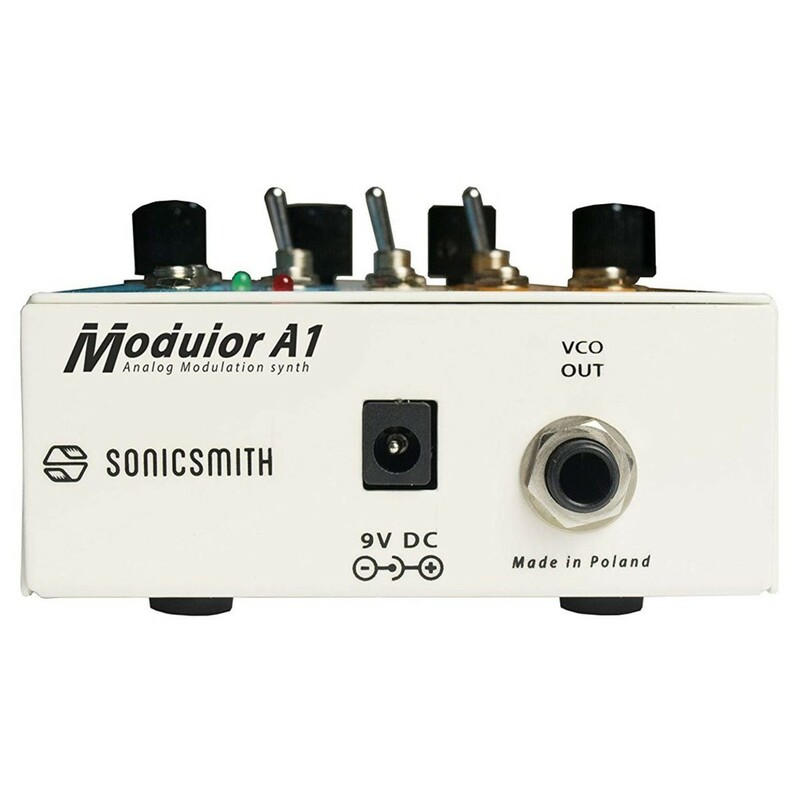 The Sonicsmith Modulor A1 is a highly-portable analog synthesizer with a voltage-controlled design and two audio outputs. 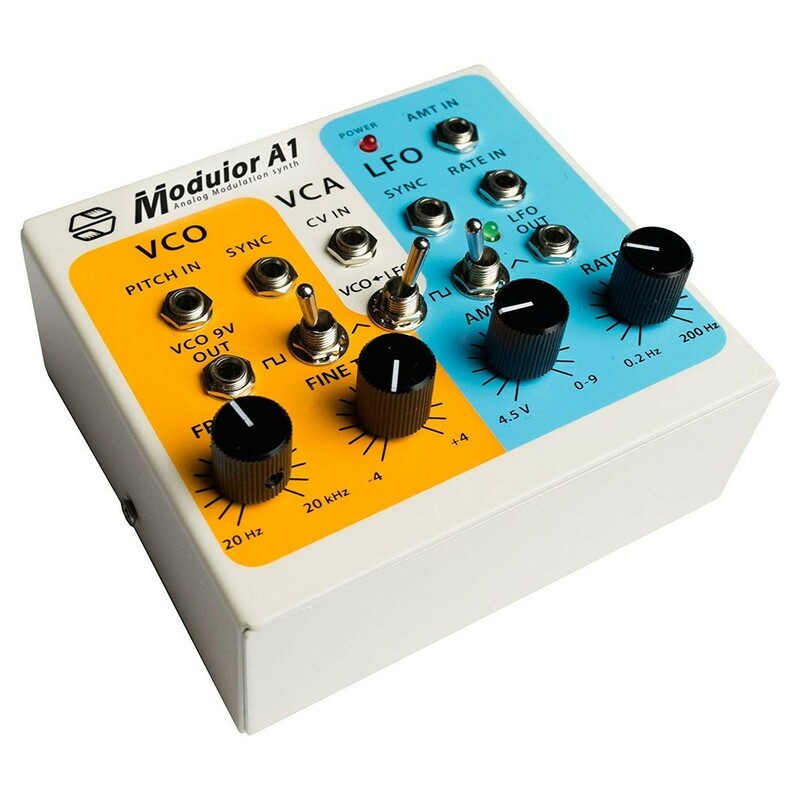 The Modulor A1 Synthesizer includes a VCO, LFO and two VCAs, ideal for creating everything from traditional basslines to cutting-edge modulated sounds. It works beautifully in conjunction with an existing analog synth rig, allowing you to take your sound design to the next level. It provides a wide range of patching options including VCO and LFO connections for square or triangle waves. The vintage-style design is similar in appearance to a guitar pedal, utilising high-grade rotary knobs for optimal precision. Unlock out-of-this-world tones from your analog synth today! The Modulor A1 is a semi-modular analog synthesizer ideal for sound design applications. The A1 Synthesizer is the perfect companion of any existing analog synthesizer rig. 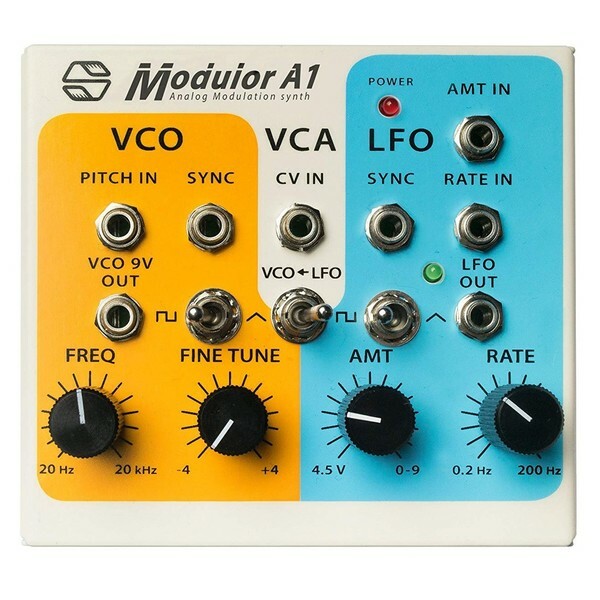 Not only is it perfect for use with analog synths, the Modulor A1 can also generate tones on its own, making for some interesting sound effects and modulation options. Each of the oscillators can be toggled between the Triangle and Square wave outputs. The first VCO operates in the standard audio range. The second VCO is designed for modulation and feeding the LFO. The wide range of path points and streamline controls makes it perfect for use with an existing analog synth rig. It is designed to enrich the sound for a more varied sound palette. It opens up a whole new world of sonic possibilities, allowing you to achieve fresh sounds from old gear. The ergonomic design is splits into three sections: VCO, LFO and VCA. These three sections feature different coloured faceplates for quick and easy changes. The VCO section includes two large rotary knobs for controlling Frequency and Fine-Tuning. A dedicated switch allows you to select square or triangle waves. The LFO section is similar to the audio VCO. It provides you with control knobs for adjusting the LFO amount (depth) and rate (frequency). It also included a sync connection as well as a dedicated output. The pitch input for the VCO is 1V/octave, as well as 9V minijack output on the front for added flexibility. The VCO sync input allows you to reset the wave’s position to zero every time a 0V threshold is broken through. 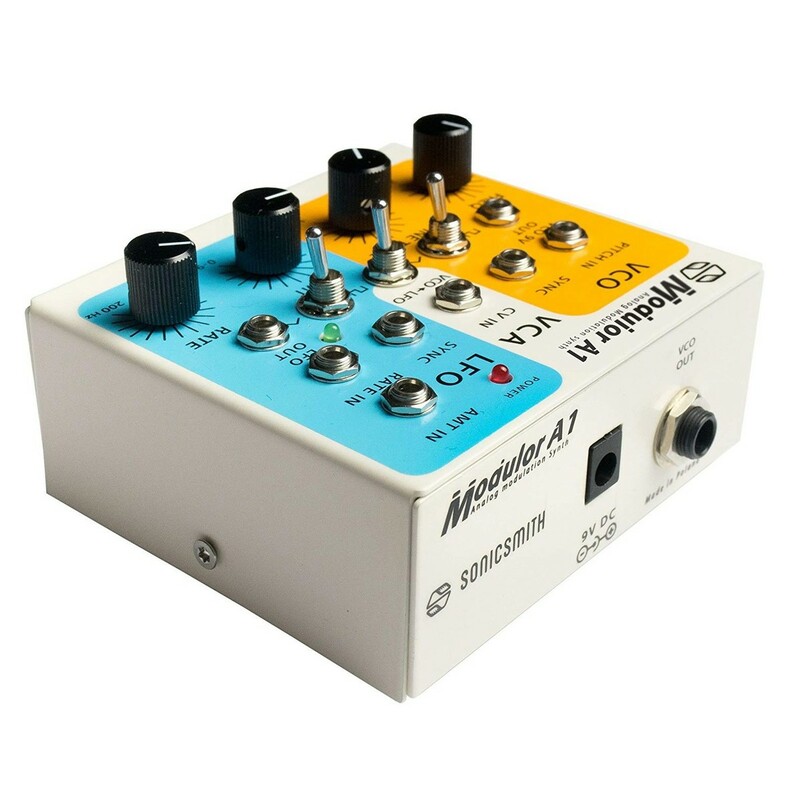 The stompbox-style design is similar to guitar pedals in stature and the colour scheme. The compact size makes the synth highly portable, fitting easily within most bags and backpacks. The large rotary encoders are oversized for maximum precision. 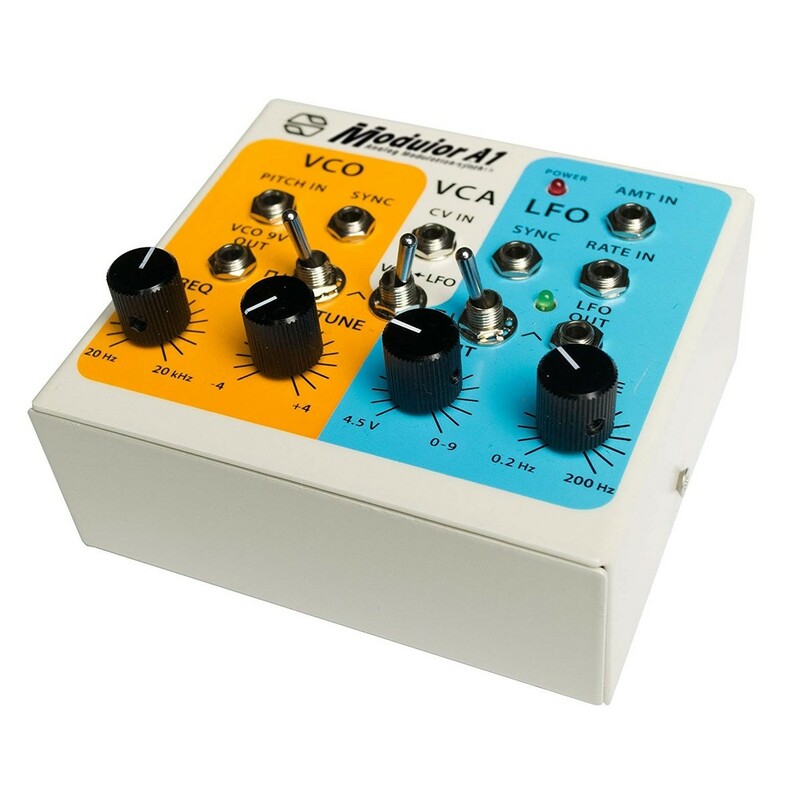 The LFO to VCO pitch input allows you to switch instantly for modulation options. The compact size provides an unobtrusive way to bring fresh sound to your existing analog rig. A sync input on both the LFO and VCO is available as well as the two VCO outputs. A big jack +4dBu post VCA and a minijack 9V out without VCA is ideal for controlling sounds as a clock or a mix into the Eurorack system. VCO with two outputs: a big jack +4 dBu post VCA and a minijack 9V out without VCA to control as clock or mix into Eurorack system.